A baker, an entrepreneur, a radio personality and a sculptor -- they are all ordinary Christians pondering how God is transforming their struggles and calling them into new life. Get to know them and explore their vocations, daily lives and redemption stories through small group lesson plans that include films, Scripture study and practices. 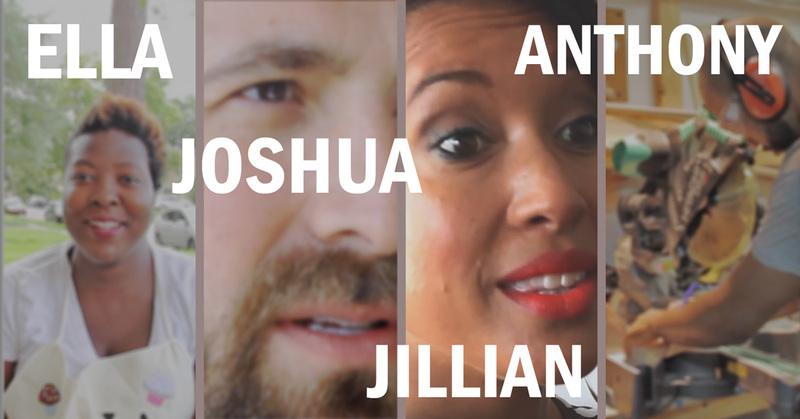 Meet Ella Russell, Joshua Bingaman, Jillian “JJ” Simmons and Anthony Suber. Like you, they are navigating challenge, suffering and mess in their lives. They are seeking to understand how God is at work in their daily lives. They are discerning God’s call on their lives. Their honest and relatable personal stories, designed for small groups to explore over four weeks, invite participants to wonder: How are we called to live our faith? How is God making all things new? How do some of the practices of our faith, such as baptism and communion, invite us into ongoing discernment? The stories of Ella, Joshua, Jillian and Anthony are told as visual poems, a unique form of filmmaking that combines creative videography, storytelling and music. This evocative style is unlike other available resources for Christians seeking to study Scripture together. Three four-session curriculum tracks allow you to choose the thematic focus that best meets the need of your group of high school youth, college students or adults. Each session features one of the films, Scripture study, and creative practices for participants to do both as a group and on their own. “Vocation” challenges groups to pay attention to how God calls us in ordinary and mundane ways and how we can live into the fullness of God’s call. “Divine innovation” leads groups to discover how God takes the old and makes it new in Scripture and in our lives. “The end” provokes groups to think a bit differently about Christian theology and God’s redemption story -- not simply as tenets or a collection of one-time events but as means of understanding how the eternal things of God are a part of our everyday lives. This curriculum has been designed in partnership with the Duke Youth Academy for Christian Formation, a yearlong program that invites high school students to live in Christ and to think deeply about being Christian. It combines a weeklong residency on the Duke University campus with a year of continuing mentorship, practice and online community. Contributors to this curriculum are Laura Addis, Dominique D. Gilliard, Kelly Ryan, Marlon F. Hall and Alaina Kleinbeck. Select a lesson plan series from the three tracks below. Vocation: How does God call us to live our faith? Theologian Frederick Buechner is often quoted as saying, “Vocation is the place where your deep gladness meets the world’s deep need.” In this set of four visual poems with accompanying lesson plans, a small group can explore how God calls all Christians to live their faith. Divine innovation: How is God making all things new? This curriculum set, including four visual poems, lesson plans and resource guides, invites your small group to consider God’s creative work in our daily lives -- even in the midst of limitation, lamentation, harm and mess. 'The end': How do the practices and tenets of Christian faith help us see God's purpose in our daily lives? In this curriculum set of four visual poems with accompanying lesson plans and resources, we will reflect on four aspects of Christian theology -- baptism, communion, our identity in Christ and the incarnation -- as means of exploring God’s transformative work in our lives.